When you think about toxins, do you ever consider metabolic toxins? Metabolic toxins (or body toxins) are normal by-products of your metabolism occurring throughout the mind and body. Organic chemist Ludwig Brieger defined a toxin as a poisonous substance produced within living cells or organisms. This excluded manufactured substances (chemical) created by artificial processes. Simply put, metabolic toxins are toxic waste byproducts produced throughout every metabolic pathway in the mind and body that must be eliminated from the body. Think of it using this analogy. Gasoline is the fuel (food) for your car’s engine (mind and body) and the exhaust (metabolic toxins) is the toxins produced by the natural processes occurring during internal combustion of your car’s engine. As you may know, if you fill your tank with the cheapest and least quality of gasoline, your car will probably not pass the emission test due to excess emissions (toxins). Your mind and body react in the same manner by producing excess metabolic toxins. Metabolic toxins can result from any dysfunctional metabolic pathway such as excess ammonia produced in the urea cycle to a variety of toxins produced by an overgrowth of normally healthy intestinal flora. What contributes toward metabolic toxins? Nutrient imbalances include nutrient excesses and deficiencies, inherited enzyme deficits, toxic elements, chemical toxicants, medications, stress, and so on. Metabolic toxins can produce a long list of symptoms and conditions throughout the mind and body. 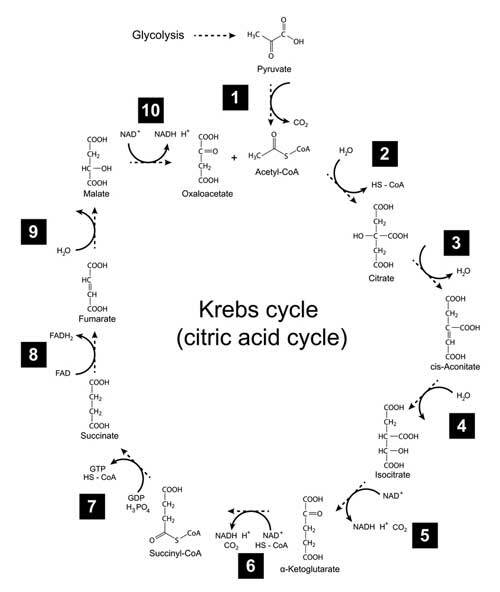 Each metabolic pathway (urea cycle, citric acid cycle, carbohydrate metabolism, neurotransmitter metabolism, etc.) requires a specific combination and proper amount of essential nutrients (or derivatives) during each step of the process. If there is a deficiency or excess of any of the nutrients required for the specific metabolic pathway, the pathway is not completed in an efficient manner and results in an excess of a metabolic toxin. In any pathway, combinations of essential nutrients may be synthesized to produce additional metabolites required for the metabolic pathway to function properly. Metabolic toxins produce a variety of metabolic intermediates known as organic acids. A urinary organic acids lab analysis is a functional analysis. This simply means the organic acids analysis can be helpful for determining whether a sufficient amount of a particular nutrient is available for a variety of metabolic pathways. If a particular nutrient is deficient, it produces specific metabolic intermediates or metabolic toxins. Sugar, in its variety of incognito names such as high fructose corn syrup, agave, aspartame, and so on, are the most common contributors for metabolic toxins. Sugar also contributes toward nutrient imbalances further increasing metabolic toxins. Simply put, sugar is poison to the mind and body – period! Simple carbohydrates such as refined flour (white bread, pasta, white rice, etc.) are all major contributors. You can find this information on the label listed as carbohydrates. As a caution, don’t be fooled by the “dietary fiber” being subtracted from the total carbohydrate content that results in the “net carbohydrate” content. It is extremely misleading. Check the carbohydrate content of every food – natural or manmade! It is NOT the FDA’s intention, no matter how unhealthy, to remove 80% of the high-carb foods in the market. As such, you may want to think before you consume that triple bun hamburger or two-inch thick-crusted pizza. You are simply loading your body (or your children’s body) with poison no matter how good it tastes! Think about the anti-freeze in your car. Most are filled with ethylene glycol. This extremely sweet tasting liquid will kill you in a matter of minutes! Just because it tastes good doesn’t mean it is good for you. One last point. Fructose is a natural sugar contained in fruits. Fructose, when over-consumed (especially concentrated fruit juices) may easily contribute toward an excess of sugar intake. Just because it is natural doesn’t mean it can’t create a problem. Remember that mercury, arsenic, and many other toxic elements are “natural” and easily create harm or death! In summary, anything that disrupts your biochemical balance is contributing toward an increase of metabolic toxins. NOTE: We realize many would like to argue “simple carbohydrates are sugar only” and everything else is a complex carbohydrate. Our response: When you become afflicted with diabetes (like Alan), you will find out exactly why “simple carbohydrates” includes a wide list of foods or ingredients that move glucose levels as quickly as sugar. Complex carbs (such as the majority of vegetables) do not produce this effect. How can I reduce metabolic toxins? As previously revealed, proper nutrient balance and healthy foods specific to your needs are essential for reducing metabolic toxins. A large percentage of metabolic toxins stems from the beginning – the digestive system. Numerous factors can compromise your digestive system. Here again, these include improper foods, supplements, medications, stress, and so on. Our digestive system begins in the mouth. However, very few actually chew their food sufficiently before swallowing. Anyway, according to our lab results, most people (>80%) have a slow metabolism. A slow metabolism is normally associated with a reduction of enzymes in the stomach needed to create an extremely acidic environment. This impairs the breakdown and complexing of nutrients for absorption throughout the digestive system. Even if you are consuming wholesome foods specific to your nutrient needs, an improper stomach environment is the beginning stage contributing to nutrient imbalances. In addition, without a proper acidic environment in the stomach, many bacteria or pathogens survive and can pass through. This not only creates a potential for adverse effects from the bacteria but also reaps havoc on the dynamic balance of our digestive flora. Keep in mind that even good digestive flora, when in excess, becomes a source of toxins! As you can see, without going very in-depth, we already created an environment for nutrient imbalances that can create or contribute to metabolic toxins. Normally, with a well-nourished and properly functioning mind/body, potentially toxic by-products are reduced and excreted. Extremely complex processes reduce toxins to non-toxic forms for excretion through urine, feces, hair, skin, etc. Properly nourished, in this context, is a dynamic balance of ALL essential nutrients that include amino acids, fatty acids, vitamins, and minerals. This also includes being toxin free. How can hair analysis help reduce metabolic toxins? First, an Organic Acid lab analysis is an excellent metabolic toxin screening; however, it too, has its limitations. In this instance, we still recommend a nutritional/toxic element screening as your primary analysis. Nutritional elements are foundational in almost every metabolic pathway. This occurs due to the direct and indirect association (nutrient interrelationships) with every other nutrient. As such, nutritional elements possess a natural synergistic and antagonistic relationship that, when required simultaneously in a pathway (i.e., zinc, copper, and iron), if one is deficient or excessive it can inhibit the proper functioning of the pathway. This increases the potential of a metabolic toxin. In addition, toxic elements also interfere with metabolic pathways because of their antagonist effect on nutritional elements as well as other essential nutrients. This can further produce or contribute toward an increase of metabolic toxins. Our hair analysis reveals both nutritional and toxic elements. Hair analysis reveals which minerals (both macro and microelements) are excessive or deficient. Due to known nutrient interrelationships (how each nutrient works with other nutrients), this also reveals needed cofactors (vitamins, amino acids, and fats) that are required to balance essential minerals and remove toxic elements. By providing the body a variety of cofactors required too dynamically balance essential minerals, you reduce toxic elements, chemical toxins, and metabolic toxins.